Mother Brain: "Metroid Mirror, on the wall...am I the cutest of them all?" Metroid Mirror: "Princesss Lana is the cutest chick. You're so ugly, you make me sick!" 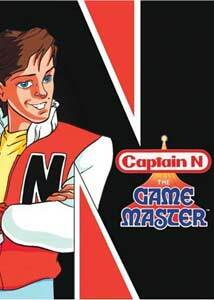 Captain N: The Game Master is a Nintendo-lovin' California kid named Kevin who, during a particularly rousing game of Mike Tyson's Punch-Out!, finds himself mysteriously sucked into his Nintendo console (a very real danger, you may recall, in 1989). With his dog Duke, he is to become the hero and champion of "Videoland," sort of a video game Grand Central Station, linking the entire game universe. Given a power-enhancing game controller belt and a Duck Hunt-style light gun, he's charged with protecting workout-video refugee Princess Lana and her kingdom from the trash-talkin' Mother Brain, a monstrously stretched face in a jar from the game Metroid. Videoland is made up of warp zones which connect to various lands famous from video games: Kong-o-land, Castlevania, Metroid, Tetris... uh... -land, et cetera. Sadly, perhaps, there's no Mike Tyson's Punch-Out!-land. The routine is pretty much what you'd expect: every week, Mother Brain and her evil minions threaten Videoland, and Kevin is called upon to protect it. Fortunately, Princess Lana is tougher than she looks, and has other friends to help: the diminutive Mega Man, Kid Icarus, and Castlevania's Simon Belmont. The bad guys? Typically the bumbling Eggplant Wizard from Kid Icarus and King Hippo from Punch-Out. In keeping with the premise, other heroes and villains pop up occasionally, with Donkey Kong raising frequent heck in Season One and Zelda and Link visiting in Season Two. That's absolutely the best part of the show: even though the formula is pretty static, you never know where the gang will wind up next. It's fun watching these classic games represented onscreen, and any kid would want to be in Kevin's shoes and popping into his favorite video games. Like in the classic The Last Starfighter, Kevin is called upon because he's such a darn good video game player, and not because he stopped to take out the trash or clean his room. Take that, mom. The show is almost brilliant in its simplicity, and in its shamelessness. The second season even begins by introducing the representative of the new product line: "Game Boy," the delightful (blech) Scrappy-Doo of this particular series. Captain N appeared on telvision near the end of the true glory days of the Saturday cartoon-as-commercial genre, and it almost works along those lines. There's something pretty cool about the idea that all of your favorite video games are part of a shared universe, and it's great to watch Kevin bounce around among them. Problem is, the show doesn't really go very far with that idea. The animation is just OK, even for the time, but the show's real fatal flaw is the poor characterization. They cast is just plain annoying, almost to the last. Kevin is appropriately charming and noble, as is the Princess, but almost all of the ancillary characters have quirks that cause me to remember the video games in which they starred far less fondly. Kid Icarus, for instance, adds a squeaky-voiced "-icus" to the end of random words. Simon Belmont is ridiculously fey. It's the kind of stuff that kids probably enjoyed for a few episodes, but undercuts any sense of adventure. It also strikes me as a peculiarly bad marketing strategy: is it really a good idea to play off your best action properties for laughs? Maybe that, as much as for the ratings, is the reason that the show lasted for just over two seasons. It admirably strives to be a bit more than one big commercial, but can't decide whether to be a fantasy-adventure for older kids or a series of silly escapades for the youngest. Not surprisingly, in trying to sell to everyone, it becomes a mush. I haven't made this cartoon review very kid-centric, only because I don't see kids as the market for the release. To newcomers, this will play as a middling 23-minute commercial for products that were big just over 15 years ago. Among the episodes that I enjoyed most, Simon the Ape Man and Quest for the Potion of Power involved two games that I enjoyed as a kid: Donkey Kong and Zelda respectively, and I suspect that it'll be the same for other viewers. This is DVD nostalgia, plain and simple, and it's going to be a pretty straight shot of it for people who watched the cartoon or were big into the whole Nintendo scene back when Nintendo was huge. Even though I was about the right age, that wasn't really me on either count, and as a result this fell flat. Still, Kevin and Duke are easy to root for in their struggles against Mother Brain and her evil minions, and it's fun seeing where they'll go next. If you're not like me, and you remember the stuff fondly, you'll definitely get a kick out of seeing the heroes and villains of the games that you pored over fight it out one more time. On a slightly more technical note, it's worth noting that the "Complete Series" label is a bit confusing. After the second season of the show, the episode length was cut to fifteen minutes and the final seven episodes were run as the back-end of the Super Mario World cartoon. This set includes just those first two seasons of Captain N (minus a second-season clip show). Not necessarily fatal, but certainly something for collectors to keep in mind. Image Transfer Review: For the most part, there isn't much to complain about with these transfers, even if there isn't much to crow about, either. The color fades in places, with a bit of grain and scratchiness throughout, so it doesn't appear that the images were cleaned up. Still, the source elements seem to have held up fairly well. Audio Transfer Review: The Dolby Digital 2.0 track is a bit flat, with some mild fading out in spots. Still, considering the source material, it's perfectly adequate. Extras Review: Each disc includes Character Bios, which are brief video introductions to the various characters with stats, descriptions, and concept sketches. Similarly, there is also one Exploring Videoland segment per disc. These are stills slideshows with original concept art for the various realms of the show. Not much to either of those, but the archival art material is a nice inclusion. The main extra is Captain Nintendo, a six-page text story from Nintendo Power magazine on which the show was based. It's a fun, brisk read, and significantly different in many respects from the series. If you played a lot of video games in the days when Nintendo was king, then you'll probably enjoy this Shout! Factory release as a fun shot of nostalgia, in spite of the missing (short) third season. All others beware: the show is a minor cult item, but there isn't much here for newcomers to appreciate.